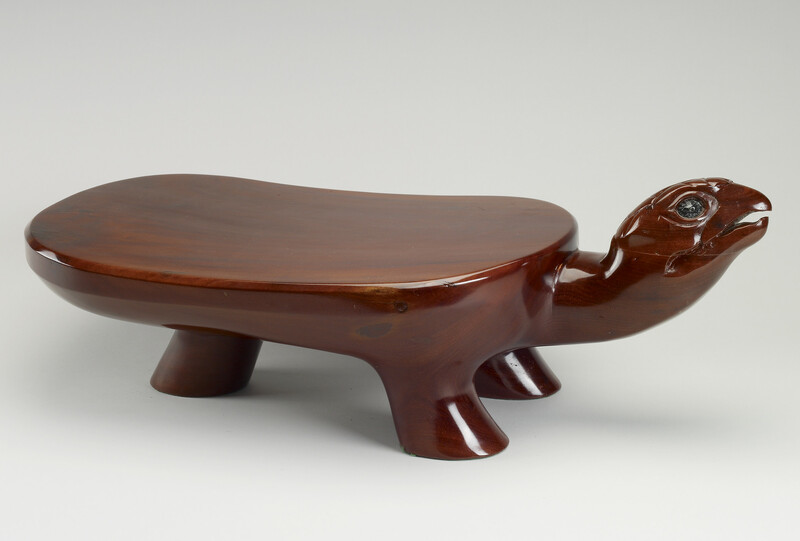 This ceremonial stool in the shape of a turtle is made from Swietenia Mahogoni, a hardwood found throughout The Bahamas, Cuba, Jamaica and southern Florida. It is commonly called 'Madeira wood' in The Bahamas, where it is thought the name originates from the early use of mahogany for casks for the shipment of Madeira wine. It was popular among the early settlers of The Bahamas for use in cabinet making and is termite resistant. The eyes are formed from two dyed limpet shells. Ceremonial stools such as this were intended for the use of the Chief and honoured guests of the Arawak Indians and almost certainly had religious significance.